A second Mastery Math Lab has opened its doors this fall to serve more than 2,000 students enrolled in university core curriculum math courses outside of the calculus track. 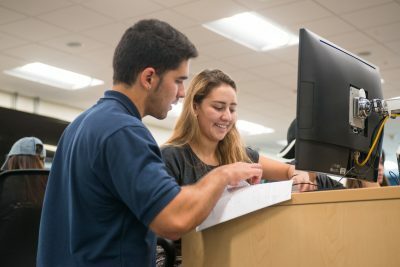 Students taking Finite Math, Social Choice Math and Statistics for Behavioral Science 1 spend two hours a week working on homework, projects, quizzes and other concepts with the help of nearly 30 full-time Learning Assistants, or peer mentors. Funded by the university’s tech fee, Lab 2 is located in room 266 of the Green Library, across from the original Mastery Math Lab. It is equipped with 126 computers and three teamwork stations for students to collaborate in group projects and consult with faculty onsite. Learning Assistant works with student in the Mastery Math Lab 2. Over the summer, faculty worked collectively to create new coursework to fit the lab environment. New Learning Assistants were vetted, hired and trained to focus on statistics and non-algebra courses. All equipment was loaded with software and tested to ensure smooth operation at the start of the semester. Throughout higher education, math courses traditionally have some of the highest failure rates nationwide. Even though math is a skill nearly every person uses on a daily basis, it has become a significant impediment to degree completion. FIU is not immune to this realty. It is what led to the creation of the Mastery Math program in 2010 — a high-tech, high-touch approach to improving student performance in College Algebra. Since its inception, nearly 1,900 students — who would have likely failed using previous teaching methods — have successfully completed the course with class pass rates increasing by 33 percent. The implementation of the Mastery Math Lab 2 will result in better math experiences for students, increased pass rates and retention rates for non-algebra courses, and ultimately increased graduation rates. For the 2016-2017 academic year, Wells anticipates as much as 10 percent increases in student pass rates for the courses served by Lab 2. These increases would result in approximately 400 more students passing their required math courses. 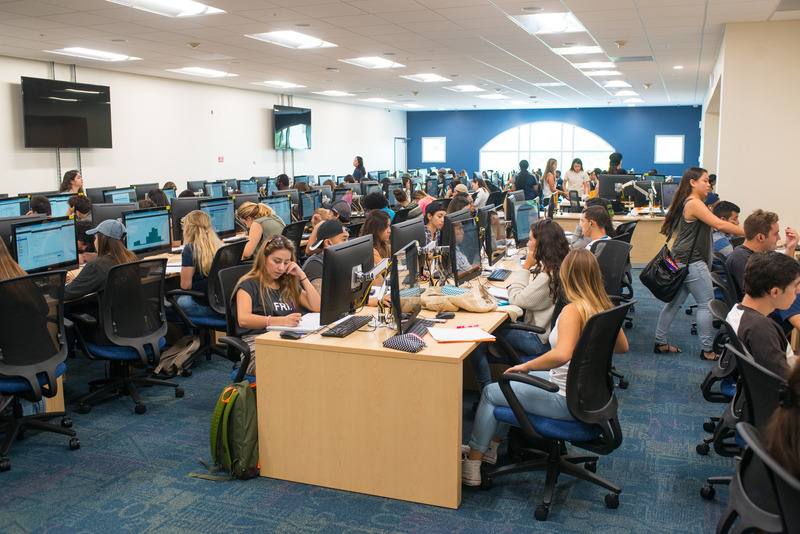 For more information, including lab hours, visit masterymath.fiu.edu.